Welcome back to the November of 1999. The Sega Dreamcast was just launched, we read rumors about the Playstation 2 and “Project Dolphin” – the next Nintendo console but the most of us sticked to the PSX and were happy about its giant line up of new games during the last months of the year. There was the WWII first person shooter Medal of Honor, and Chrono Cross (Not in Europe sadly) and there was the latest sequel for the a bit aged Tomb Raider series. Tomb Raider IV: The Last Revelation placed Lara Croft into Egyptian Tombs, had a story about reviving the ancient god Seth and included typical enemies like Mummies and Skeletons as well. The game added new moves for Lara, had a phenomenal level design for its time and was gaining high praise by the most critics and gamers. Even today, over a decade after it was released, fans are drawing art about this title or – like in this case – spent hours to create a composition of 3D Models, the right scenery and add effects like the dust and light. Tomb Raider IV: The Last Revelation is a 3D action adventure made with the Tomb Raider III Engine and was first released for the Sony Playstation, Sega Dreamcast the PC and Mac Platforms. In 2009 it was re-released for the US PSN, in 2011 also for PSN Europe. Since 2012 it is also available for PC again via Steam. 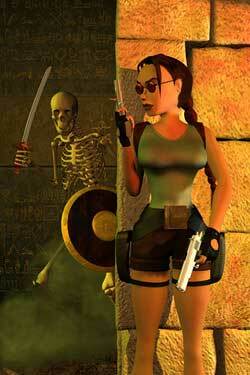 This is the first Tomb Raider related featured Fan Art as part of the Blast of the Past Articles.